Overuse of chemicals in farming raises concerns about food on our table, Yang Wanli reports from Yunnan and Shandong provinces. It seems incredible that farmers would shun the vegetables they send to the cities. But that is the case in Xundian where 100 hectares of greenhouses provide vegetables for Kunming, about 50 kilometers away. Farmers next door will not eat them due to health concerns. "Chemicals and fertilizers are widely used. We have to use them to grow bigger and more beautiful vegetables to meet market demand," local farmer He Chengliang said. "But we only eat those grown in our courtyard without the use of chemicals. The variety may be limited but they are safe and healthy." It's not just that farmers use chemicals to control insects and boost the growth of plants and vegetables. It's that they are overusing them, far more than farmers in other countries. The government has taken steps to tackle the problem. It has banned or limited the use of highly toxic chemicals, and promoted better agricultural practices. The use of chemicals has been fed largely by economics. He, 54, has grown vegetables for more than 30 years in Southwest China's Yunnan province. Most villagers no longer raise livestock, he said, so they have no ready manure. Buying it costs more than chemical fertilizer, and without pesticides, farmers would need to hire more people to kill pests for smaller harvests. "Traditional ways of farming will raise the cost and can hardly meet the increasing demand from urban areas," He said. "If no chemicals are used, most urban people could not afford the vegetables." Use of pesticides grew nationwide from about 700,000 tons in 1990 to 1.7 million tons (about 30 kg a hectare) in 2008, said Jiang Gaoming, an Institute of Botany researcher at the Chinese Academy of Sciences. Average use of pesticides per hectare in China is three to five times higher than in most other countries, according to a report by the National Business Daily in June. And nearly 90 million hectares of crops are polluted every year. Caijing magazine reported in September that the use of chemical fertilizer throughout China in the 1950s was 10,000 tons a year. By 2007, it was 51 million tons. Agriculture Vice-Minister Wei Chao'an said at a national conference in July that China's consumption of chemical fertilizer constitutes 35 percent of global market share, equal to the US and India combined. "We've got many problems . . . that will not only threaten our health, but also harm the farmland," Jiang said. Overuse of fertilizer "will cause the soil to pack together". It can kill earthworms and other organisms that aerate soil and contribute to fertility. Global sales of farm chemicals hit $45 billion in 2009 and are expected to reach $52 billion in 2014, according to the Freedonia Group, an international business research firm. China has become one of the biggest players - as both producer and consumer. In 2009, it made more than 2 million tons of farm chemicals, exporting 800,000 tons. Organic (synthetic) pesticides have been widely used worldwide since the 1940s and still take the major market share. Low-toxicity - and expensive - biological pesticides account for 1 percent of sales in China. 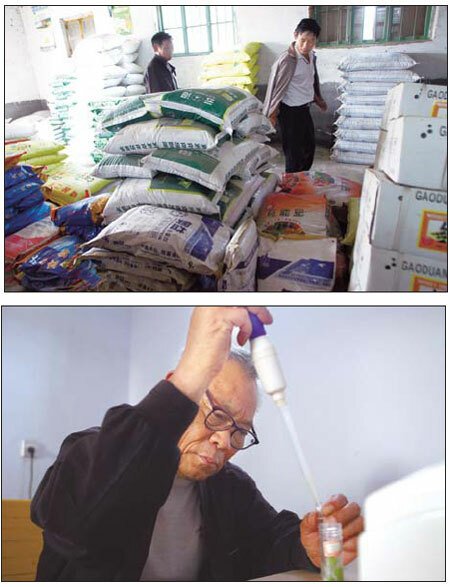 Liu Xiulian, 54, has sold pesticides and chemical fertilizer in Zibo, East China's Shandong province, since 1996. She owns a family store covering about 20 square meters. Liu said pesticides sell well during the busy season, May to August, but the business supports her family of four year-round. "Every family is using farm chemicals. It's a good business," she said. "Compared with doing city jobs for 40 or 50 yuan a day, we don't need to go out while selling farm chemicals, which is easy and earns more." "I don't think farm chemicals are as horrible as some people believe," said Pan Canping, director of the Agriculture Ministry's Quality Testing and Inspection Center for Agricultural Products. Severe insect and plant disease infestations afflict roughly 60 percent of cultivated land in China, Pan said. He estimated that farm chemicals save 58 million tons of grains, 1.5 tons of cotton, 50 million tons of vegetables and 6 million tons of fruit every year. Pan said Chinese agriculture is moving toward a healthier, environmentally friendly development. Use of highly toxic and hypertoxic agricultural chemicals is forbidden for insect control, and they cannot be applied to vegetables, melons, fruits, tea, and herbs used in traditional Chinese medicine. The regulations were issued by the Ministry of Agriculture in 1997. Farm chemicals must be registered before they can be sold. By the end of last year, the ministry had approved registration for 600 farm chemicals marketed under 14,000 brands. After evaluation by the ministry, changes in the "maximum use" labeling - sometimes allowing stronger solutions, sometimes weaker - were required for 200 chemicals. The ministry plans to regulate 7,000 other kinds of farm chemicals, completing those most commonly used, within five years. For modern agriculture, chemicals including fertilizers seem to be unavoidable not only in China but also in other countries. But their potential for harm can be mitigated by generally agreed-upon good agricultural practices (GAP). Practices vary by jurisdiction, but China's GAP took effect in May 2006. The principles are broadly outlined for the farm level in 10 areas, including crop and fodder production, harvest and on-farm processing and storage. The common theme is that all possible measures must be taken to prevent food-borne disease as fresh produce moves through production and distribution systems. For example: To extend their effectiveness, some pesticides contain chemicals that keep them from easily being washed away by rain. It takes time for those chemicals to break down into harmless compounds, so it's important to use minimal amounts and to allow sufficient time to elapse between the last application and harvest. "We called it the pre-harvest interval, which is an important part of GAP," said Pan, the quality testing and inspection director. "Only by following GAP strictly can we enjoy safe agriculture products." Pan said more than 96 percent of vegetables in China meet safety standards for chemical residue. Those that do not result from failure to follow GAP principles. "The problem not only exists in China, but also in advanced countries," he said. Shouguang, in Shandong, is the "vegetable city" of China. About 60 percent of its cultivated land is devoted to growing vegetables, and it produces about 4 billion kg of them each year. It also has taken the lead in promoting safer farming by cracking down when tests show that residues of farm chemicals exceed 50 percent. Levels above that amount indicate that either too much was used or the chemicals were applied too close to harvest. "Almost all villages in Shouguang have a testing office and technicians will do the test every day," said Fan Quande, the Nanfan village chief. "If any hypertoxic chemicals are found on vegetables, the whole plastic greenhouse should be destroyed and farmers who grow those vegetables will be detained." In fact, he said, 10 greenhouses were destroyed and six farmers in the village were punished in the past two or three years. 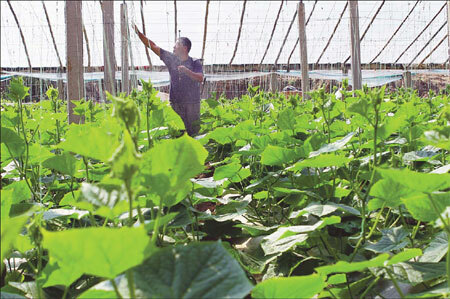 Nanfan village has about 400 families and each owns a greenhouse that covers about 1,000 square meters. Fan Jiude, 46, grows cucumbers that bring his family 40,000 to 50,000 yuan a year, he said. "In recent years, no highly toxic pesticides have been sold in the market and we dare not use them because of the severe punishment," he said. Fan, who has grown vegetables for more than 25 years, knows about other risks. "The hypertoxic pesticides are so strong that once I was poisoned in the greenhouse, just because I wiped away sweat after spraying without washing my hands. It made me throw up and I stayed in a hospital for three days." According to the most recent statistics available from the Ministry of Health, more than 17,000 pesticide poisoning cases in rural areas were reported in 2000, and more than 1,000 people died. About a quarter of the poisoning cases happened during farmwork. In Fan Jiude's greenhouse, some small plastic bags lay on the ground, empty containers for chemical fertilizer he uses to make his cucumbers grow larger. The instructions on the back of the bag said the contents should be diluted 1:15 - one part fertilizer to 15 parts water. Fan said he uses only 10 parts water. In the village's agricultural testing office, the man conducting the tests is supposed to wear gloves and use tweezers when he cuts rind from a cucumber to test for chemical residue. He had neither but, when prodded by the village chief, used scissors instead of tweezers. But he said he does wash containers after each sample is tested and uses distilled water - both parts of the protocol - so the results can be trusted. "That's where the problem is," said Jiang, the botany researcher. "Public sectors are speeding up to build a safe system, but the effect still lags behind. It takes time to educate farmers and to run the system well in the grassroots units." Sun Jingbo and Wang Jing contributed to this report.